The Kentucky Racing Health & Welfare Fund, Inc. is a charitable, non-profit organization that helps certain eligible individuals in the Kentucky thoroughbred racing industry who demonstrate need. It was founded in 1978. It provides benevolent funding toward the payment of medical, hospital, dental, vision and funeral expenses. It is not an insurance company. It does not provide insurance benefits. The information found at this website should not be construed as a policy and shall not be considered as an offer to extend assistance, benefits, coverage or payment. The Fund provides benefits for off-the-job injuries and illnesses which are not covered by welfare plans, worker’s compensation, social security, public welfare, military benefits, veterans benefits or any other type of health, medical, dental or accident insurance. Provided assistance for 800 Kentucky race track licensees. Assisted Kentucky race track licensees with health related benefits 3,034 times while paying 5,277 health related invoices. Provided more than $1,200,000 in health benefits. Surpassed $44.2 million mark in total health benefits paid out since our inception in 1978. Contributed $250,000 to the Kentucky Race Track Retirement Plan, bringing its total contribution to $6.5 million in seventeen years. Signed up 361 eligible individuals to the Kentucky Race Track Retirement Plan; active membership as of December 31, 2017 is 554 licensees. Sponsored the Kentucky Racing Health Services Center, which provided treatment or medical services for 1,389 patient visits for a $5 co-pay. The Health Services Center is located at The Old School, 422 Heywood Avenue, Louisville, KY 40208. Call (502) 636-2900 for hours of operation or to schedule an appointment. Click here for hours of operation or to schedule an appointment. Open all year. Sponsored the Horsemen's Wellness Center @ Turfway Park, which provided free treatment or medical services for 51 patient visits. The Wellness Center is located next to the Horsemen’s Lounge in the grandstand. Call (859) 647-4764 for hours of operation or to schedule an appointment. Open during race meet. The Kentucky Racing Health and Welfare Fund Guidelines are subject to change without notice. The Board of Directors serves on a voluntary basis and meets to consider requests at its own discretion. It is the applicant's responsibility to supply the Fund with the information necessary for the Board to give proper consideration of his or her request. Our office is located at 422 Heywood Ave. (at the corner of 5th St.) just a block north of Central Ave. and Churchill Downs. Please come to the 5th street entrance. 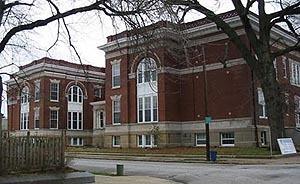 The 107 year old building that once was the John Heywood Elementary School has been transformed from a boarded up eyesore to a model race track worker’s resource center, known as “The Old School” (2004 Ida B. Willis Historic Preservation Award). Located one block north of Churchill Downs, the facility has 40 modern one bedroom and studio apartments for race track workers who are 55 years and older or disabled, with income limitations. The building is also the home of the Kentucky Racing Health and Welfare Fund, Inc., the Kentucky Race Track Retirement Plan, and the Kentucky Racing Health Services Center which provides free medical assistance for certain Kentucky Horse Racing Commission licensees.